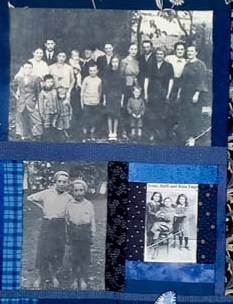 This website, featuring the Holocaust Quilt, is made possible through the generosity of the Sam and Regina Greene Foundation and the Jerry and Anita Zucker Family Endowment Fund (Coastal Community Foundation). The Holocaust Quilt is stored at the Charleston County Library's main branch located at 68 Calhoun Street Charleston, SC 29401. An adventure into Holocaust history by a group of seventh and eighth grade Social Studies and Language Arts students at Gregg Middle School in Summerville, South Carolina, turned into a commemorative quilt. The finished product, a 94- by 79-inch quilt, is now in the collection of the Charleston County Public Library as part of the Jerry and Anita Zucker Holocaust Collection. This website presents information found during the process of creating the Holocaust Survivors' Quilt. The project served as an effective learning tool for the students to comprehend the incredible impact of the Holocaust, with an emphasis on understanding its connection with contemporary history. The students' research consisted of contacting the survivors and their families in order to collect artifacts such as photographs and other memorabilia, some unimaginably graphic and poignant, to sew into the quilt. The students also recorded interviews of four of survivors. The idea for the quilt came to assistant principal Anne Sbrocchi during the summer before the 1998-1999 schoolyear. 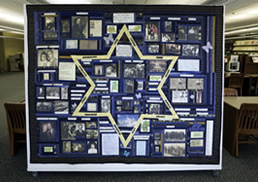 During that year, teachers Dottie Stone, Debra Matthews, and Lynn Morillo incorporated the Holocaust into their Social Studies and Language Arts curriculums, culminating in the production of the quilt. Materials and labor for the quilt were donated by People, Places and Quilts in Summerville, and Kinko's of West Ashley created the photograph transfers used on the quilt. This website links the quilt to the Holocaust Archives Project at the Addlestone Library of the College of Charleston. Our intent is to aid students and others to access information about local Charleston area Holocaust survivors. Each quilt section will have a page dedicated to it that contains information such as additional photographs, videos, sound clips, transcribed interviews, or other documents pertaining to the survivor's experience. The ultimate goal is to provide as much background information as possible to accompany the visual material.